Branle? Branl? Bransl? Bransle? Brawle? Whatever. But pronouced 'Brawl'. This is a really odd dance in the eCeilidh repertoire. The feel is more French / Breton than English but if you ask people teaching French / Breton, they say "Weaving in and out? That's not French, that's Scottish or English"
Nevertheless, the roots are from a collection called Orchésographie by Thionot Arbeau (pseudonym and anagram of 'Jehan Tabourot') dated 1588. and while the weaving in and out isn't part of the Branle des Chevaux , it is part of the dance one page further in the book, the Branle de la Montarde . The Horse's Brawl danced as part of the eCeilidh repertoire dates from the Albion Band's reconstruction when John Sothcott joined the band in the mid 1970's. 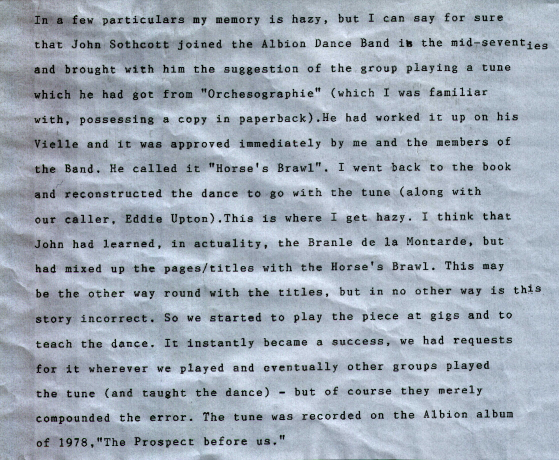 He bought the Horse's Branle tune with him and the Ashley Hutchings and Albion's caller Eddie Upton fitted a dance, the Branle de la Montarde , to it (cf details from the Albion band). The dance is different from normal eCeilidh fare in that you won't find the feet doing anything 'naturally English'. The dance does not work if you try to fit steps, skip steps, step hops or the other options from 'English Country Dance'. If the feet, however, have done a little French or Breton then they know. The horseshoe moves round in a circle - or to describe it better the eight people are in a line facing in, holding hands and the person on the leftmost end of the line, the 'number one', gradually pulls the line round. If you slide the feet a little the initial steps you get a contrast between the the steps and the jump. The music should also give you a pronouced beat on the two-footed jump landing. The music gives you time for 8 of these steps. So 'number one' lets go with his or her right hand and spins and dances across to the other end of the line. It's quick, just four steps if it was a plain walk (but it isn't). The second in the horseshoe does the same, the third and so on.... It's an opportunity to show off footwork, dancing skills, ability to stay standing up etc. With 8 people the music gives enough time for all to dance across, but everybody has to start on the beat. It is quick; a count of 4 and the next starts; a count of 4 and the next and so on. If it all works, everybody dances across and the 'number one' reappears back at the head of the line again. At the end of the weaving the old 'number one' joins hands at the end of the line and the new 'number one' gets ready to lead round again. The Horse's Brawl, as the original Branle des Chevaux , lives on despite its recent mixing with the Branle de La Montarde moves. The description, even the formation, is open to discussion but it can be read as having the partners facing each other, there's a le ieune homme tenant la Damoifelle par les deux mains which somehow suggests you are facing your partner. There's a fine teasing apart of the confusion in the Horse's Nemisis (or Why "Horse's Branle" gives dancemasters headaches ). 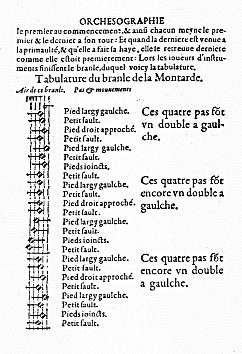 A translation of the Horses Bransle moves. The Letter of Dance notes on Sixteenth Century Choreography delightfully entitled Basic Brawling Techniques and a detailed dissection of the moves. 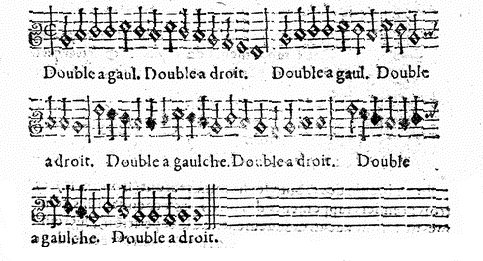 The Horse's Brawl as an eCeilidh dance comes from the Branle de la Montarde rather than the Branle des Chevaux but there is still a degree of divergence - the three part Horse's Brawl tune leading to a three part dance where the original Branle de la Montarde has only two parts. There's a translation in the SCA Cheat Sheets. 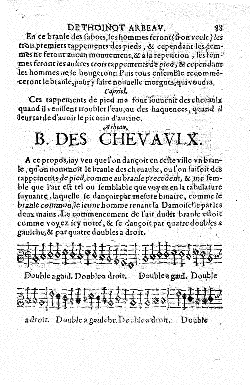 As above, under the comment "Dance reconstructions so early they're conjectual"
The music for the Horse's Brawl comes from Orchésographie, for the Branle des Chevaux, where a dance is described a page or so later. The eCeilidh version is from the Albion Band's reconstruction, recorded on The Prospect Before Us.